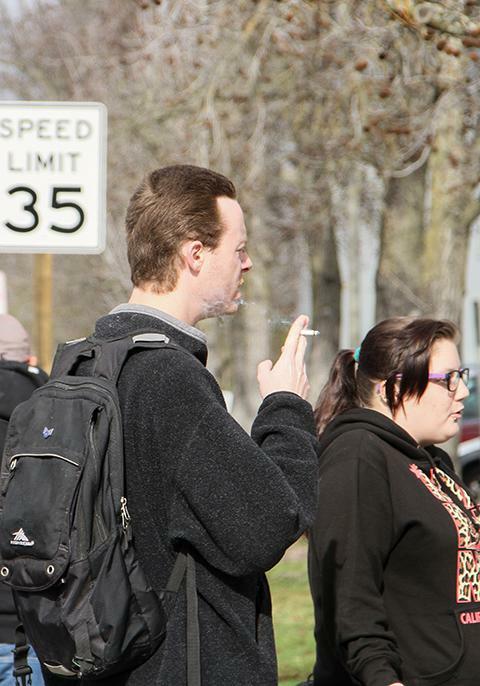 American River College’s new smoking ban is affecting all students and faculty, but even amongst the complaints, those who must now leave campus for their smoke breaks are not too upset with the change. ARC’s smoking ban, which went into effect on Jan. 1, 2016, prohibits the use of cigarettes, chewing tobacco, e-cigarettes and vaporizers on the campus and makes ARC the first college in the Los Rios District to implement a smoking ban. With the school transitioning quickly from a campus with very little smoking limitations to being completely smoke-free, there have been some expected complaints. Kelly Langen, a first-semester ARC student, called the ban “mildly annoying” because of a lack of ashtrays and garbage cans near the bus stop on College Oak Drive right in front of campus, where she goes for her smoke breaks. However, Langen was glad to see vaporizers being banned as well as cigarettes and recognized that bans on smoking are starting to becoming commonplace. Tristen Reynolds, a psychology major at ARC, attributed the ban to helping her cut back on smoking. Several students, including Reynolds, have voiced complaints about the weather, as a rainy spring season approaches. “When it rains and you take a smoke break, you end up soaked,” said Reynolds. Justin Balistreri, a third-semester ARC student, pointed out that the ban took away all covered smoking areas, like the Liberal Arts breezeways. For many students, smoking reduces stress and can alleviate headaches. “It would be easier to smoke outside of classroom and go back inside whenever you’re done,” said Reynolds. Students don’t believe the ban is affecting their schoolwork, and Langen, Reynolds and Balistreri all agreed that they’ve never been late to class or left class because of a smoke break. 1 Comment on "ARC students have varying reactions to the new campus-wide smoking ban"
The faculty and students who smoke at the RT bus stop in front of the Administration building should bear in mind that Regional Transit has already banned smoking at the bus stops, and using that area to smoke is really rude and reinforces the image of the entitled smoker.